More Talk of MMA on Network TV: CBS-UFC Deal Nearly Finalized? NBC to Follow Suit? One thing appears clear: NBC won’t be airing the most popular MMA events, which come from the Ultimate Fighting Championship. The UFC is in advanced negotiations to air specials on CBS in the first quarter if the strike continues, the source said–adding that a deal could close as soon as this week, facilitated by Viacom network Spike, which holds UFC cable rights. The 1/19 UK show would be a natural candidate for CBS since it comes only four days before an Ultimate Fight Night scheduled for Spike TV. In the past Spike TV has been reluctant to air events that close together, turning down the UFC’s Ireland show earlier this year. The interest in MMA programming is coming from NBC’s entertainment division and would seem to fit with Ben Silverman’s (the network’s new entertainment head) penchant for high-concept reality series. MMA –where contestants can use a range of techniques from kicking to punching and beyond, which some consider a sport, others entertainment–is booming amid a young male audience. MMA, however, contradict NBC’s carefully cultivated image as the network with high-quality programming targeted at upscale urban audiences. A previous effort in the pugilistic area, “The Contender,” proved to be a flop. UFC 78 was a very forgettable lackluster show. Rashad Evans defeated Michael Bisping by split decision in an uninspiring main event that left neither man validated. While lacking star power, the card was expected to be one of the most exciting of the year with several strong matchups on paper. In the end no fight lived up the hype as Frankie Edgar and Karo Parisyan ground out convincing but unexciting decisions over Spencer Fisher and Ryo Chonan respectively. The biggest news coming out of the show was the destruction of rising star Houston Alexander by undefeated Thiago Silva. Alexander had an impressive build up to the fight with several rounds of positive media coverage and received the biggest reaction of the night from the New Jersey crowd. However, in the ring he was overwhelmed by Silva who took him to the ground and finished him from the mount in 3:25 of the first round. The words Randy Couture were again banned from the production, despite his presence in Parisyan’s corner. The company continues to mishandle the situation by refusing to acknowledge it on air. On a similar note, Quinton Jackson, whom you may remember as the charismatic UFC Light Heavyweight Champion, was also dealt with curiously by the announce team. His presence in Michael Bisping’s corner, despite heavy screen time, was not acknowledged until the third round when an inset shot of him was displayed. Jackson is rumored to be unhappy with his current contract and has been noticeably absent from recent UFC broadcasts. At the post show press conference Dana White reportedly said, “Rampage is out for a little while…we got some plans, can’t talk about them yet, but we got plans for him….and no it won’t be Rashad.” There has been growing speculation of Jackson and Forrest Griffin as coaches of the next season of the Ultimate Fighter leading to a title fight in the summer. The show is slated to begin filming early next year so we should know something soon. White also announced that Anderson Silva will defend his UFC Middleweight Title against Dan Henderson at UFC 82 March 1 in Columbus, Ohio. Countdown wasn’t as strong as usual. They did the best with what they have to work with, but it was obvious that even Dana White and Joe Rogan weren’t as excited as usual. In a lot of ways the Countdown show, like the event itself, looked like it was about going through the motions. After watching the hype show I’d have to think anything over 300,000 buys would be a huge success. Of course, it’s really hard to make even an educated guess at this point with much of what we thought we knew about the UFC’s pay-per-view business being turned on its head recently (Liddell-Jackson at 625,000, Couture-Sylvia at 534,000, and Couture-Gonzaga at 485,000). The product seems to have cooled off a little in the second half of the year, that combined with what is undoubtedly the weakest lineup on pay-per-view of the year means that this show should establish a new baseline for the UFC on pay-per-view. The show pushed the Light Heavyweight division as the premier division in the sport with the idea that the winner of Evans-Bisping would be top 5 and the winner of Alexander-Silva would be top 10 in the division. Evans-Bisping just doesn’t do much for me coming off their most recent outings and most of the hype rang hollow. They tried several different angles including undefeated and first meeting of TUF Champions, but nothing really did it for me. Greg Jackson might have cut the best promos on the match which is probably less than ideal. Houston Alexander overshadowed Evans and Bisping. He has a good look, a good story, and gives a pretty good promo. The total package gives him something of a Rocky aura, a working man’s hero, a journeyman fighter finally getting his big break. Those qualities combined with two impressive flash knockouts give him the chance to be a star. It would have been nice to see an All Access in support of him. There was a new narrator on the show (possibly because of the Hollywood strike?) who I thought gave the show a starker feeling. It worked for the most part, but I can’t decide if it was an improvement or not. It was certainly noticeable. Matt Sera v. Matt Hughes for the UFC Welterweight Title was originally scheduled to headline UFC 78 with Sera defending against his bitter rival in his own backyard. That bout was subsequently pushed to December to accommodate the Ultimate Fighter Season 5. Sean Sherk defending the UFC Lightweight Title against BJ Penn was then scheduled to headline, only to be derailed by Sherk’s positive drug test and subsequent suspension. Once that bout fell through, the promotion officially hit the panic button. The company toyed with the idea of rushing (if seven years of waiting can ever qualify as rushing) Chuck Liddell v. Wanderlei Silva before eventually turning to Tito Ortiz to headline against Rashad Evans in a rematch of their draw from UFC 73. That match fell apart when the UFC grew tired of waiting for Ortiz to sign a new contract. With tickets about to go on sale for the event and pay-per-view ads due, the company turned to Evans v. Michael Bisbing billed as a battle of unbeatens. The bout may the be most unanticipated battle of undefeated fighters in the history MMA if not all of combat sports. Both fighters are coming off controversial decisions. Evans is coming off a draw with Ortiz in a uninspiring match that he would have lost had Ortiz not been penalized for grabbing the fence. Bisbing is coming off a roundly criticized split decision victory over Matt Hamill at UFC 75 that saw him physically dominated. Despite records of 15-0-1 and 15-0 respectively, Evans v. Bisbing looks far more like a compelling TV main event at this point than a pay-per-view headliner. Dana White has done his best to make the most out of a bad situation, first reportedly saying that the winner would get a title shot at 205, before promoting the fight as placing the winner in the top 5 in the division. The truth is that Michael Bisbing looked destined for the middleweight division after being physically dominated by Hamill before the UFC 78 main event came calling. Evans turned in a conservative losing effort to an injured and underwhelming Ortiz in a bout that left almost no one clamoring for a rematch. The winner of the fight will stake a place in the suddenly crowded Light Heavyweight Division. From a business perspective you can make an argument either way, but from talking to White this week for an upcoming FIGHT! magazine feature it’s obvious that he is incredibly committed to the international marketplace, especially in Europe. A Bisping win at 205 before riding off into the sunset of a weak Middleweight Division would put the dream of the Count as an international draw on track. On the other hand, Evans has a certain charisma outside of the ring, but hasn’t been able to put it together into exciting performances inside the octagon, save for his spectacular KO of Sean Salmon last January. In reality neither man is ready to contend at the top of the 205 pound division. At best the winner of the bout will find themselves in place as a stepping stone for Forrest Griffin to walk over in route to a big money title bout next year. Evans and Bisping both have the potential to be legitimate top contenders and draws, but the time is now for neither. The most interesting clash in the Light Heavyweight Division at UFC 87 for my money is Houston Alexander v. Thiago Silva. Alexander has star potential even in his mid-30s. A win over the undefeated Silva would set Alexander up for a run at the top of the 205 division in 2008. The rest of the main card is rounded out by exciting but unheralded fighters. In the most high profile undercard bout, Karo Paryisan looks to make it three straight following his loss to Diego Sanchez in August of last year and continue his climb back into contention at 170 pounds with a win over Ryo Chonan. Frankie Edgar and Spencer Fisher meet in a bout that not only has title implications in the Lightweight Division, but also promises to be a fight of the night, if not year, contender. Joe Doerksen v. Ed Herman rounds out the main card. Dave Meltzer reports that the 10/31 episode of the Ultimate Fighter drew a 1.06 rating (1.3 million viewers). Males 18-34 did a 1.23, 1.05 in Males 35-49. The show was down almost .2 from the previous week, however, Halloween may have played a large role in the decline. Donruss, a leading trading card company, is set to enter the MMA space with a new card set in early 2008. The set will feature 25-40 fighters from across MMA and include special autograph and memorabilia cards. 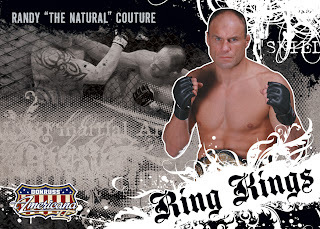 The Ring Kings set represents the first major fore ray into MMA by the trading card industry, a $200-300 million dollar business in the United States annually. Today the IFL announced a video sharing partnership with YouTube and Google Ads. The IFL becomes the first MMA producer to partner with YouTube, following the lead of the NBA, NHL, CBS, and EA Sports among others who have similar partnerships with the website. At first glance, the move may seem insignificant, but in the long run it may represent the beginning of a significant trend in the MMA industry, towards internet content and away from traditional television platforms, specifically pay-per-view. We donâ€™t know what the future is. It will be some combination of digital, pay per view and traditional broadcast, but regardless you have to build the fan base through strategic partnerships and good old fashioned marketing of your talent. The goal is to control as many rights as you can so that when the right opportunity comes along you are in position to act. Thatâ€™s why the IFL model will work. We, unlike any other organization, control the rights and likenesses of our athletes, our coaches, our teams, we produce our own TV and handle our own in arena show with a solid grassroots base. We are one stop shopping for any business partner and thatâ€™s something you cannot say for 99% of the sports or entertainment properties out there. The deal will provide IFL content to thousands of websites. The IFL will also share in the advertising revenue generated by the video content. IFL videos are already popular on YouTube with over one million views in recent months. The partnership will launch this week when the IFL premiers fights from its 11/3 World Grand Prix show through YouTube. The much discussed UFC fighters symposium took place on 11/3 in Las Vegas. UFC President Dana White first started discussing the idea of the conference earlier this year following a series of drug test failures. The meeting was originally scheduled to address steroids, however, it was later expanded to include a variety of topics including contracts, taxes, media protocall, and general business practices. The UFC reaching out to its fighters and expanding the lines of communication is a positive development for not only the company, but the sport generally. Greater transparency and more open communication will take on greater importance as the industry continues to expand. Two weeks after Mayweather beat De La Hoya, the UFC staged the biggest card in its history, when Chuck Liddell met Quinton Jackson at the very same Las Vegas casino. In the moments before that main event, it felt like the torch had been passed. What’s happened since, though, has at least changed the arc of the story in which the smarter, hipper guys pound a stake through the heart of a sport that has somehow survived for the better part of 300 years. Liddell, the UFC’s number one attraction, lost. A few months later, he’d lose again. For all of its great star-building machinery, mixed martial arts faced the same issues as boxing when a bankable champion bites the dust. Meanwhile, the dying sport of boxing was refusing to expire just yet. With HBO on pace to break the UFC’s pay-per-view record from last year, there is no doubt that boxing has enjoyed a rebound this year. However, this “resurgence” has largely been built on the back of Oscar De La Hoya. It remains to be seen whether the Mayweathers, Pavliks, and Cottos of the world are ready to carry the sport. Of course, as the article alludes to, the UFC faces a similar problem with many of its first generation of stars (Liddell, Couture, Hughes) on there way out. The difference is the business model. The UFC with exclusive contracts and a strong weekly television platform is well positioned to develop new stars. Randy Couture is auctioning off the Hummer H2 he was given as a coach on Season 1 of the Ultimate Fighter. Bidding starts Monday on eBay. Meanwhile, Dave Meltzer reports that the UFC recently completed filming of another edition of All Access featuring Wanderlei Silva. Silva trains at Xtreme Couture in Vegas, however, the UFC refused to film him training in Couture’s gym. Instead they had he and his workout partners use the UFC gym and the Xyience Training Center. Participants were also told that they couldn’t wear Xtreme Couture gear during filming.